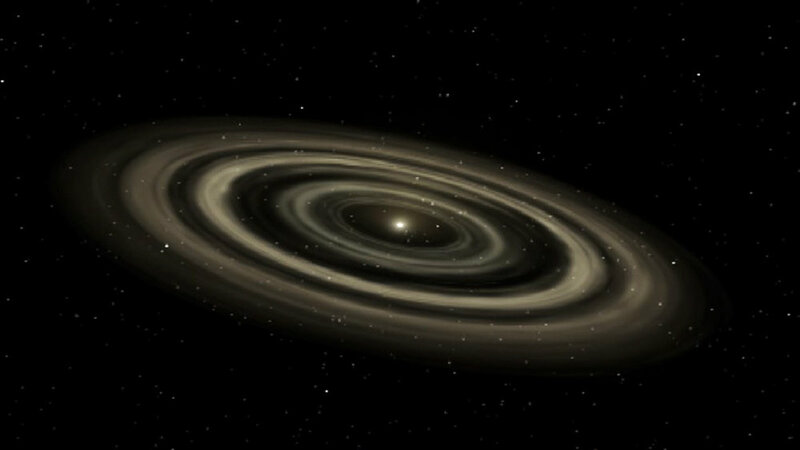 Can A Star Ever Turn Its Spin Backwards? The stars in the night sky all have their preferred direction of rotation, which depends directly on the exact way that the cloud of gas and dust that the star formed out of collapsed. If there was slightly more random motion in a clockwise or a counterclockwise direction, as the cloud of gas collapsed, the star would have magnified that hint of rotation, spinning up the same way that a figure-skater does, pulling in their arms and legs. Once spun up this way, another piece of fundamental physics comes into play - inertia. Inertia tells us that objects in motion tend to stay in motion unless there’s something else that’s causing that object to slow down. On Earth, that something else can come in many forms - we have the mass of the Earth, whose gravity will pull objects down towards the surface, an atmosphere to move through, which will slow objects moving through it, or quite simply mountains and buildings which objects can bounce off of and away from. If you’re in space, these sorts of Earthly obstacles which can serve to stop a moving object aren’t around. There are many fewer things which could serve to stop an object’s motion - without a thick atmosphere to move through, the planets and our spacecraft continue at their current speeds without any impediments. The most common method of slowing down (or speeding up) an object in space is by traveling near another large object (ones that are of a similar mass to yourself are the most effective) and letting the force of gravity alter your path. These requirements for an external force hold both for motion as we normally think about it (a forward or sideways motion) and for spin. So if we think about spinning a bicycle tire, that wheel will continue to spin until the forces of friction in the axle (primarily) will slow it down, or until you clamp down on the brakes. An object which is spinning in space has no friction-containing axle around which to spin, and so if it’s isolated, without any external objects which can act as a braking force, that object should continue to spin as it is, ad infinitum. This is basically the situation that stars find themselves in. Stars do not reverse their spins as a standard part of their lifetimes. A reversal in the rotation of a star is extremely difficult to accomplish without something external to the star punching it backwards in the other direction, to slow down each rotating particle that makes up the star. If you could, using magic, reverse the rotation of our own star, without changing anything else, the planets surrounding our Sun wouldn’t be influenced at all - the orbits of the planets are determined by the gravitational pull of the Sun, which hasn’t changed if we haven’t changed its mass, plus the planets’ own velocities. What sort of objects could act as a brake in space? The is easiest is always a good old large-scale collision. This is how we think the Earth formed the Moon, how Uranus got tipped onto its side, and Venus got tipped completely upside down. So if we wanted to reverse the spin of the Sun, we’d have to hit it with something pretty catastrophic in order to both stop the rotation of the gas & plasma which currently makes up the Sun, and reverse the direction of the spin. Any impact on that scale would definitely impact the planets. If it was another star that hit our own, we’d have gravitational and temperature-related chaos even before the impact, setting aside whatever cataclysm of energy would be unleashed during the collision. Remember to vote for Astroquizzical, which has been nominated for Canada's top 12 favorite science blogs!